US aviculturists whisper in excited anticipation: US Fish & Wildlife Service (FWS) may within the next two years “delist” the amiable golden conure — or Queen of Bavaria conure (Guaruba guarouba), legalizing US sales of the bird. As golden conures readily bond with humans, pet market pundits predict the golden conure will rise rapidly on the chart of favorite bird companions, just as they have in their native Brazil. Treasured for its playful, even clown-like personality, as Shantel Telly Byrd’s baby Opie shows, these large conures of the lowland rainforests can entrance with their affectionate playfulness. Sporting a golden head variegated with green streaks, Opey exemplifies juvenile goldens. By age two the green feathering on the head yields to a solid golden headcap. Initially taxonomists assigned the golden conure to its own genus, given its unique status as a conure which raises chicks communally. Also, unusually, golden conure chicks may exhibit a “naked”, or featherless, state in early development. Later, scientists placed this parrot in the Aratinga genus, alongside the sun conure, and the white-eyed, jenday and mitred conures. Recent genetic studies, however, suggest golden conures have closer affinity with the red-shouldered macaw (of which the Hahn’s macaw is a sub-species) and the blue-crowned parakeet, gaining for this “Queen of Bavaria” once again its own genus, guaruba guarouba. While not as threatened as originally supposed, the golden conure nevertheless has received less extensive study than more common parrots. Native to Brazil’s lower Amazon basin, the “golden parakeet” inhabits rain forests above flood lines, at an altitude below 300 meters. Although deforestation continues, the golden conures relative ease of reproduction in aviaries means, in actuality, pet ownership helps maintain adequate biodiversity within the species. A frugivore, in the wild the golden conure flocks in clans of approximately ten birds. From incubation through the chicks’ fledging, a parental pair typically enjoys the assistance of “reproduction helpers”. Commonly these helpers are prior years’ nestlings, staying near their parents until pairing off to mate. The reproduction helpers guard the nest as eggs incubate, and they gather food and feed chicks after hatching. Golden conure hatchlings achieve adult size rapidly, by about two months of age, at which time they also fledge. Reaching sexual maturity approximately one year after the disappearance of their green head streaks, i.e., at about three years of age, golden conures may not, in fact, mate until significantly later, perhaps only at six to eight years of age. While, as an extreme example, a golden conure may live 60 years in captivity, evidence suggests that in the wild the average lifespan is only fourteen years. Similarly, a pet in your home, while it likely would have a longer life than in the wild, will not on average reach 60 years of age. The initial underestimation of native populations of golden parakeets led to conservation aviculture projects for ex situ breeding and reintroduction. 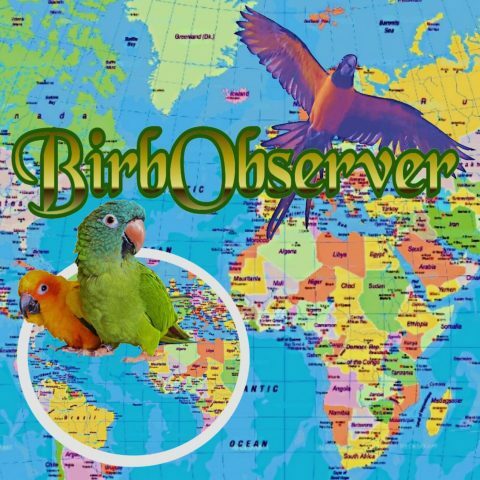 In its recent comments on the proposed delisting, the Organization of Professional Aviculturists (OPA) noted that one such program recently designated 24 captive-bred golden conures for release, having trained them to forage and react to predation. While three died prior to actual release, a mated pair from that group hatched and successfully raised the first documented wild-born Golden Conure from the program. Enlivened with curiosity, intelligent and affectionate, golden conures may be considered rather shrill as a household pet. As an aviculture venture, breeding Queen of Bavarias is considered intermediate in difficulty. Challenges an aviculturist or pet owner might face include fungal diseases, plucking, and self-mutilation. It has been suggested that a diet overly heavy in seeds or oil might contribute to plucking. Previous Previous post: Psitta-Social: No Stopping Sydney Birdies!